In a winter’s night of Paris a Spanish artist named Carlos Casagemas announces a goodbye dinner at the Brasserie de L’Hippodrome. He has been in love with the model Germaine Pichot, but she rejects him: ‘He started shouting, and she called him impotent in front of everyone… He turned green and ran.’ Pichot attends the dinner, and ‘dug up her real husband for the occasion.’ The young man gets up to make a speech. ‘But instead of a sheaf of notes, he pulls out a revolver.’ Points it at Germaine. ‘Now you’ll get yours.’ Bang. And turns the gun on himself. ‘And I’ll get mine.’ Blam. Such was Paris in 1901. ‘To be young in Montmartre in 1900 was to know cruelty, violence, madness,’ remembers Fernande Olivier in Birmant and Oubrerie’s comic biography. ‘In this filth, this slum where a band of ragged immigrants in rags invented modern art’. She continues: ‘Picasso loved me. Picasso painted me. He always wanted to erase me from sight… Instead, he made me eternal.’ Shuffling along the streets today – we see them through her eyes, a jarring collage of tourist pastels – she soars into the sky. She remembers herself at seventeen: ‘perched in a tree, being forced to marry a man I didn’t want.’ Birmant and Oubrerie give us a great juxtaposition of yearning here – the old woman looking down on her former self who is herself gazing out beyond the trees to the lights of the city. 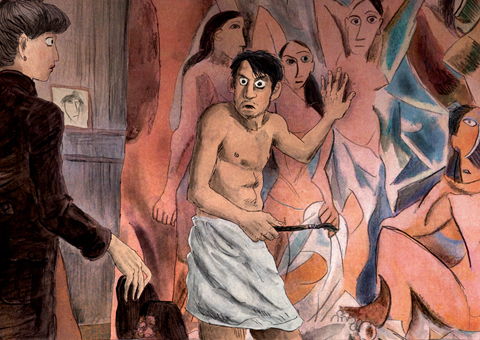 Pablo is written like a novel rather than biography, exploring the young Picasso’s life and his development as an artist throughout the 1900s. Like many art histories though, it’s collated into ‘periods’: the passages of his life following the suicide of his troubled friend Casagemas are rendered in deep aqua and turquoise shades, rain, shadows, clouds, night. Art shows and functions are done in royal scarlet pixels. During his ‘African period’ Picasso sees ‘Iberian heads, his totems from Gósol’ streaming through the air like birds, and a black-red shaft shoots out of his eyes with the legend I SEE ALL.